BILOXI, Miss. — Hurricane Nate slogged its way across the U.S. East Coast on Monday, dumping heavy rains and bringing gusty winds to inland states as a tropical depression, a day after it brought a burst of flooding and power outages to the U.S. Gulf Coast. 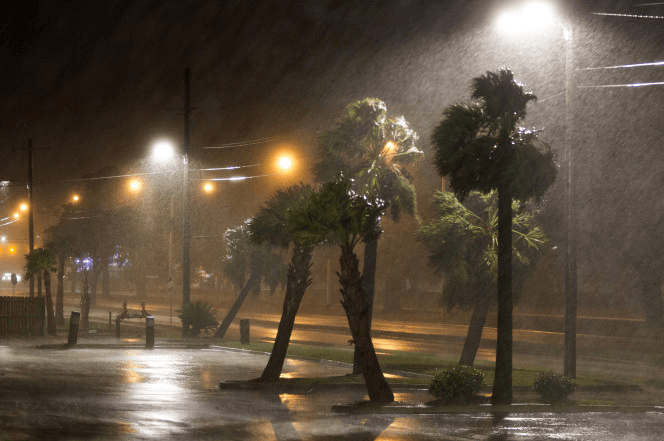 The storm surge from the Mississippi Sound littered Biloxi’s main beachfront highway with debris and flooded a casino’s lobby and parking structure overnight. By dawn, however, Nate’s receding floodwaters didn’t reveal any obvious signs of widespread damage in the city where Hurricane Katrina had leveled thousands of beachfront homes and businesses. Mississippi’s Gulf Coast casinos got approval to reopen in midmorning after closing Saturday as the storm approached. Sean Stewart, checking on his father’s sailboat at a Biloxi marina after daybreak, found another boat had sunk, its sail still fluttering in Nate’s diminishing winds. Stewart was relieved to find his father’s craft intact. “I got lucky on this one,” he said. Before Nate sped past Mexico’s Yucatan Peninsula late Friday and entered the Gulf of Mexico, it drenched Central America with rains that left at least 22 people dead. But Nate didn’t approach the intensity of Harvey, Irma and Maria — powerful storms that left behind massive destruction during 2017’s exceptionally busy hurricane season. “We are thankful because this looked like it was going to be a freight train barreling through the city,” said Vincent Creel, a spokesman for the city of Biloxi. The head of the Federal Emergency Management Agency said the four hurricanes that have struck the U.S. and its territories this year have “strained” resources, with roughly 85 percent of the agency’s forces deployed. “Hurricane Nate had the potential to wreak havoc on Louisiana, but thankfully, we were largely spared major damage,” Gov. John Bel Edwards said in a statement. In Alabama, Dauphin Island Mayor Jeff Collier said he woke up around 3 a.m. Sunday to discover knee-deep water in his yard. Although some homes and cars on the island had flooded, Collier said he hadn’t heard of anyone needing rescue. At landfall in Mississippi, the fast-moving storm had maximum sustained winds near 85 mph, the U.S. National Hurricane Center in Miami said. Nate steadily weakened after its first landfall in a sparsely populated area of Plaquemines Parish, Louisiana. Nate was expected to bring 3 to 6 inches of rain to the Deep South, eastern Tennessee Valley and the southern Appalachians through Monday. The Ohio Valley, central Appalachians and Northeast could also get heavy rain before the storm exits Maine on Tuesday. Willie Cook, 75, spent his morning chopping a pecan tree that fell in his backyard. He said Nate was nothing like Katrina, which pushed 8 feet of water into his east Biloxi house. “The wind was blowing, but it wasn’t too rough,” Cook said of Nate. “Thankfully, right now we have no major damage reports,” he said. Hancock County Emergency Management Agency Director Brian Adam said Nate’s storm surge flooded low-lying roads, but he hadn’t heard any reports of flooded homes. “We turned out fairly good,” he said as he prepared to survey neighborhoods. Also Monday, a new tropical depression formed far out over the Atlantic. The depression’s maximum sustained winds were near 35 mph. It was expected to strengthen to a tropical storm later in the day or overnight, the U.S. National Hurricane Center said. The depression did not pose a threat to any land.